PolyFlex DS 3 Gallon Bucket – Roklin Systems Inc.
PolyFlex DS is designed for the experienced users of Roklin’s products. PolyFlex DS was formerly known as Dopey Soup and can be used for concrete repair or asphalt repair. Available for use with almost any type of aggregate that is available locally, PolyFlex DS must be used with aggregate that is very clean, free of dust & debris, and dry. We recommend the use of our specially-coated sand for the best possible results. PolyFlex DS chemicals and aggregates must be carefully measured to achieve the correct ratio. It is also important that you do adequate testing for your specific application. Performance may vary depending on the type of aggregate used and the type of end use. 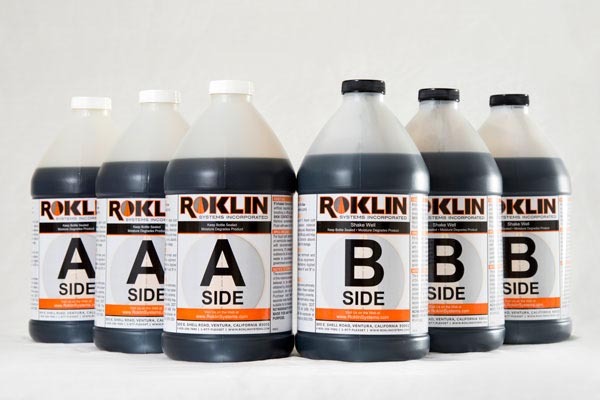 This product is not recommended for first-time users of Roklin’s concrete and asphalt repair products.